Whilst carrying out a student placement Lauren Buttle, a candidate for a Masters of Art Conservation at Queen’s University in Ontario, Canada, was involved in the first stage of the conservation process of Albrect Dürer’s Triumphal Arch, assisting in cleaning the 3.5 m x 3 m, 16th- century print. 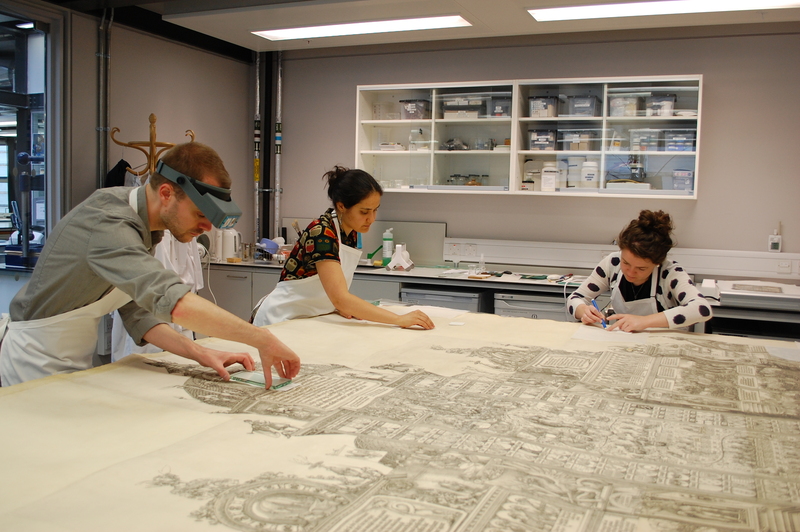 Conservation student placements, Tom Bower (left), Carina Rosas (centre) and Lauren Buttle (right) surface-cleaning Dürer’s Triumphal Arch. As a student placement in the Western Art on Paper Conservation Studio at the British Museum this summer, I was expecting a few objects to be placed on my workbench that would present some new and interesting challenges. I was not, however, expecting a 3.5 m x 3 m, 16th-century print collage. As readers of Joanna Kosek’s previous article on this project will know, the task of unframing Albrect Dürer’s Triumphal Arch and transporting the work to the conservation studio was a major undertaking on its own. Now that the work is in the studio, the even trickier question arises: how do you clean the centre of such a large print? Unfortunately, as high-tech as the brand new studios here at the British Museum are, the option of having conservators suspended from the ceiling like ninjas, was not part of the design brief. A more practical option was designed by heads of department, Joanna Kosek and Caroline Barry, along with the conservation mounters. To transport the print to the studio, a large tube was designed and created to gently roll up the Triumphal Arch. A secondary, smaller tube was then created to catch the print as it was partially unrolled onto the table. The surface of the print could then be cleaned in horizontal bands across the edge of the table and then rolled beneath the table surface onto the second roll in stages. Diagram of the surface cleaning set-up for Dürer’s Triumphal Arch. Although the print has been behind glass for at least 30 years there is still some surface dirt. If dust and dirt were not removed at this early stage then any subsequent wet treatments would fix the dirt in the paper fibres. While the surface cleaning of the print continues, the team carefully documents all aspects of condition and structure of each sheet of paper: everything from tiny pinholes to large watermarks and embossings. This information helps to inform us of the history of the print and will come in very useful during the next stages of treatment. To do this, thin sheets of transparent polyester are placed over each of the 42 individual pages that make up the image, and all characteristics of the page are mapped using permanent markers and a key of symbols created specially for this project by conservator, Megumi Mizumura. Conservators Emma Webb (left) and Megumi Mizumura (right) mapping out damage to individual pages of Dürer’s Triumphal Arch. Once the mapping is complete, the fun begins! The conservation team has been hard at work for several weeks now using a variety of different dry sponges, erasers and brushes to lift the surface dirt from the print, taking care to avoid all printed media. This means using magnification and a steady hand to carefully clean in between each printed letter… for 10 square-metres. Luckily for us summer students, the conservation team have been happy to let us step in and get involved. The cleaning continues in the studio for now. Once this is complete, the next step will be to remove the soiled and degraded textile backing from the assembled pages. No doubt, there will be more exciting challenges to come!